Brussels (AFP) – Palestinian leader Mahmud Abbas will ask the EU to officially recognise the state of Palestine when he meets foreign ministers from the bloc on Monday, a senior official told AFP Sunday. Palestinian foreign minister Riad al-Malki said Abbas will tell the EU it should take the step “as a way to respond” to US President Donald Trump’s decision to recognise Jerusalem as the Israeli capital. Abbas will also “reiterate his commitment to the peace process” in the Middle East, Malki said in an interview with AFP in Brussels. 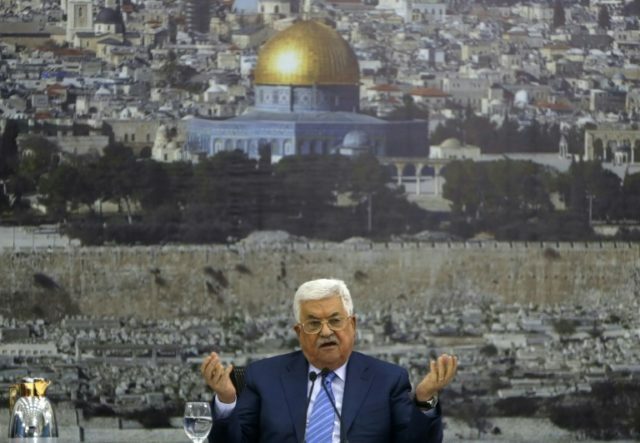 A week ago Abbas denounced Trump’s efforts to resolve the long-running conflict as the “slap of the century” and caused alarm by saying Israel had sunk the so-called Oslo accords that underpin the stalled peace process. “Since Trump’s decision has altered the rules of the game, he (Abbas) expects the European foreign ministers to come forward and collectively recognise the state of Palestine as a way to respond back to Trump’s decision,” Malki said. Abbas’s talks in Brussels come as US Vice President Mike Pence visits Israel during a tour of the Middle East with Arab anger still smouldering over Washington’s hugely contentious decision on Jerusalem. Abbas will urge the EU to take on a bigger role in trying to move peace efforts forward, declaring American “exclusivity and monopoly” in the process is over, Malki said. “If the Europeans want to be a player then they have to be fair in their treatment of both parties and this should start with the recognition of the state of Palestine,” Malki said. Abbas will meet EU diplomatic chief Federica Mogherini and the bloc’s 28 foreign ministers on Monday on the sidelines of their monthly meeting, after Israeli Prime Minister Benjamin Netanyahu made a similar visit last month. Diplomats and officials in Brussels say recognition for Palestine is not on the cards on Monday — the EU leaves recognition in the hands of individual members — and the best Abbas can hope for is progress towards an “association agreement” with the bloc. Malki told AFP that while the Palestinian Authority was “very serious” about such an agreement, they also expected to be formally recognised as a state. “One does not replace the other. Absolutely not,” he said. Despite Abbas’s comments on the Oslo accord and his insistence that the United States can no longer serve as mediator, Malki said he was still committed to the peace process — effectively frozen since 2014. “He wants to reiterate his commitment to the peace process. He’s going to say I’m not going to withdraw from the peace process, I will stay committed,” Malki told AFP. Trump’s son-in-law and senior adviser Jared Kushner has been working for months with a small team to develop a new US proposal to revive peace talks between Israel and the Palestinians, but no details or even news of progress have emerged. A senior EU official said Friday the bloc “believes a plan is in the making” but is still in the dark about “the content of this plan or the parameters”. Malki said it was “very clear to us we should not wait until the Americans present their plan”. “The Americans should understand that the Palestinians, the Arabs, everybody, will not accept an American plan that does not include Jerusalem, that does not include settlements, that does not include refugees,” Malki said.